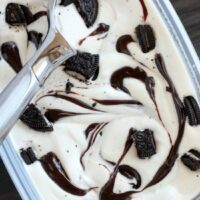 No Churn Oreo Fudge Ice Cream - Dessert Now, Dinner Later! 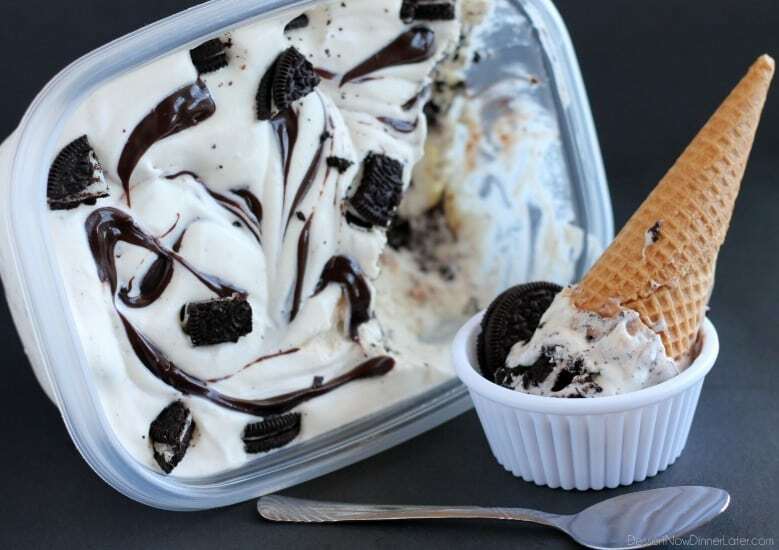 NOTHING compares to my love of cookies and cream ice cream, and this No Churn Oreo Fudge Ice Cream, hit the spot BIG TIME! 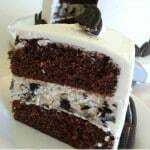 My favorite part are the soft, BIG chunks of Oreo cookies! Homemade ice cream is the best because you can put as much of the toppings in as you want. No skimping like a grocery store carton of ice cream! 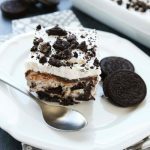 If you make any ice cream from my blog, and you are an Oreo lover, (because let’s face it, who’s not?) then you HAVE to make this! Oh, and the fudge doesn’t freeze completely either, so it’s smooth and chocolatey! Delicious! Enjoy my friends! In the bowl of a stand mixer with the whisk attachment, whip the heavy cream until stiff peaks, about 3½ minutes on high speed. Fold in the sweetened condensed milk until well blended. Gently fold in most of the Oreo pieces, saving a few for the top, for looks. Using a 2 quart container, pour ⅓ of the ice cream mixture. Drizzle with the hot fudge. Pour another ⅓ of the ice cream mixture; drizzle with hot fudge. Pour the last ⅓ of the ice cream mixture. Drizzle with hot fudge, and swirl with a knife. 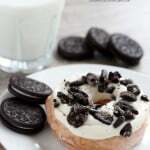 Top with remaining Oreo pieces. Freeze 6 hours or until firm; freezing overnight is good. Store in the freezer. You had me at no churn! Can’t wait to make this! 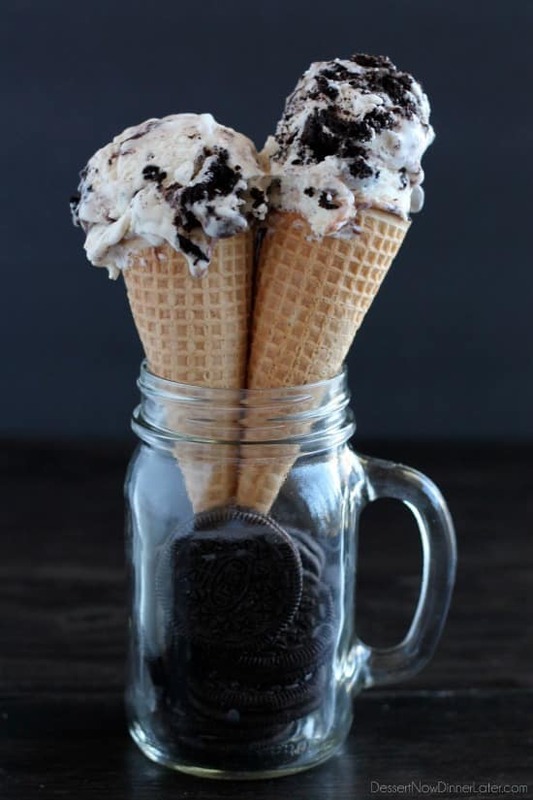 Heyo, oreos + ice cream. Yes, please. Wow, this looks seriously amazing! 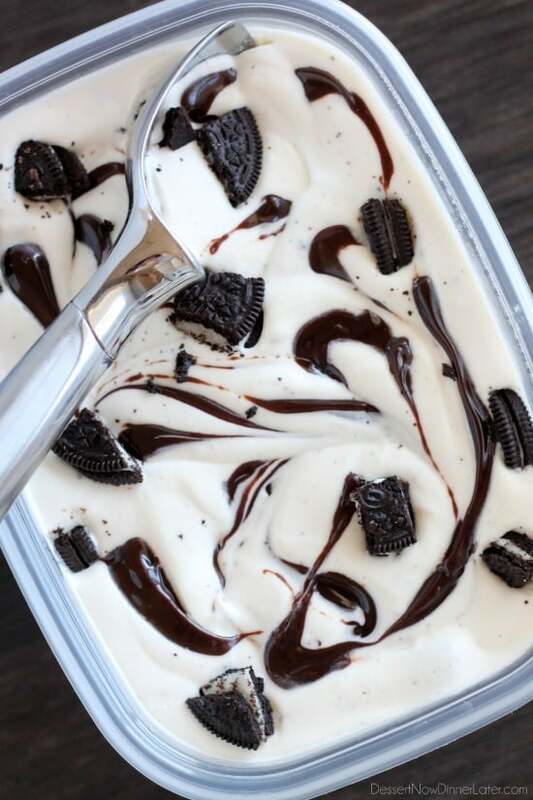 Love that it’s no churn too and with Oreos? Gaah so so good! My favorite homemade ice cream to date! I cut the Oreos in large chunks and have lots of them! So good! My favorite flavor for sure! Thanks! 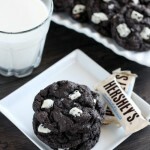 Oh my goodness this looks so delicious, I have to try it! Thanks, it’s my favorite homemade ice cream for sure!